Purpose: Numerous studies suggest that Radio Frequency Identification (RFID) technology can provide improved container handling efficiency; however, there is a relative lack of research concerning tracking and monitoring of vehicle movement in the container terminal environment. This study therefore aims at assessing the feasibility of applying RFID for vehicle tracking purposes in a container terminal. Design/methodology/approach: This study makes use of a series of experiments in a container terminal in order to discuss the factors that affect the use of RFID in the terminal. The possibility and accuracy of using RFID in such a challenging environment is also investigated. These propositions are investigated by a means of case study. Findings: The experimental results indicate that RFID communication is good in the container areas which are nearly all the terminal area. However, in other areas such as the sea side and free area, the performance is not so good and 100% readability can only be achieved in 5m and 10m. Originality/value: The container terminal environment, with different transport vehicles for onward transportation, will affect the performance of RFID readability. Poor setup of the RFID reader and tag will lower the feasibility of RFID adoption as well as increase the cost. In order to address the challenges of implementing RFID in such an environment, this paper describes a series of real site testing experiments to study the RFID performance. This represents an original contribution to research and practice in RFID adoption in container terminals. With the advance of globalization, transportation is playing an important role. Numerous containers are transported from port to port, from vehicle to vehicle, every day. As transportation distances become longer and the volume of international transportation increases, many companies are involved in the transportation of one assignment from one location to another. It is hard to manage the containers, such as how to arrange the container schedule and route for avoiding heavy traffic; how to track the container locations continuously. Additionally, containers look the same and it is also hard to identify them in the terminal. These challenges make tracking of the vehicles and containers very important. Efficient information can help the users to manage their transportations. This is the reason why there are numerous studies using information and communication technologies in vehicle and container tracking. To deal with this problem, recently developed technology provides an efficient way. Radio Frequency Identification (RFID) is an emerging technology that uses wireless radio to identify objects from a distance without requiring line of sight or physical contact (Borriello, 2005). RFID enables the user to capture real-time information in fast moving and bulky product flows with the aim of achieving a high degree of efficiency and assuring high quality. The components of a typical RFID system include an RFID tag, an RFID reader, an RFID antenna, an RFID middleware and the backend system. The RFID tag is the identification device attached to the item to be tracked. The RFID reader and antenna are devices that can recognize the presence of RFID tags and read the information stored on them. The aim of RFID middleware is to process the transmission of information between the reader and other applications after receiving the information. Middleware is software that facilitates communication between the system and the RFID devices. Figure 1 shows a typical RFID system and illustrates how the elements fit together. Recently, the lower costs and the increasing capabilities of the RFID technique attract attention in keeping track and monitoring the containers in the terminal (Hsu, Shih & Wang, 2009; Park, Dragovic & Kim, 2009; Ngai et al., 2010). Woo, Choi, Kwak and Kim (2009) proposed an activity product state tracking system architecture which is able to track products even when they are in a box or a container. Abad et al. (2009) developed an RFID-based system for traceability and cold chain monitoring of food. Wang et al. (2009) proposed a RFID-based decision support system to monitor, trace and track products in containers. Chao and Lin (2009) analyzed critical factors affecting the adoption of a container security service, which is composed of auto-detection and RFID technologies, from the shippers’ perspective. Cao and Xiao (2011) analyzed a propagation prediction model and the performance of a container RFID system under metallic container production circumstances. These applications encourage study of RFID to realize vehicle tracking in container terminals. However, although numerous studies involving the installation of RFID have demonstrated the benefits of better container handling efficiency, a relative lack of research concerning tracking and monitoring vehicle movement in the container terminal environment is appearance. Vehicle tracking is a way to improve company efficiency and in effect, increase profitability, especially in the business of large vehicle fleets (Hsieh, Yu, Chen & Hu, 2006). The tracking system is the enabling technology, and is the key to release the value trapped in asset management. By its non-contact, scan-based data reading characteristics, it automates the asset tracking and data acquisition that enables an enterprise to locate vehicles (i.e. cars, trucks, etc.) and even uses location information to optimize services. With the help of tracking information, the manager is able to access one or more driver locations and gets their status information on a real-time basis (i.e. checking if the drivers execute the order; if they follow the driving routes; if there is any traffic congestion, etc.). However, implementing RFID as a vehicle tracking system is difficult as the container terminal environment, which involves different transport vehicles for onward transportation, will affect the performance of RFID readability. Poor setup of the RFID reader and tag will lower the feasibility of RFID adoption, as well as increase the cost. In order to address the challenges of implementing RFID in a container terminal, this study examines the RFID performance in such an environment. Several real site testing experiments were conducted in a port and the results show that RFID is reliable and is capable of adoption in a container terminal environment. The tracking of vehicles and containers has become a very popular research topic in recent years and there are several techniques which have been applied. To start with the simplest one – the “vehicle-card” technique (Rus, Bilcu, Egiazarian & Rusu, 2004), makes use of STD phone booths and a specially designed vehicle-card. Vehicle owners are provided with a card that a driver carries to the nearest tracking point, basically a designated STD booth on a vehicle route or highway, at major stops and petrol stations. Details of the vehicle, coded on the card together with a simple numbered message, are transferred to a local telephone number using a Voice Response System. At the receiving end, the receiver uploads all incoming messages by email to a central hub, where it is processed and placed on a website. Vehicle owners or centralized controllers can keep track of where each of their vehicles are. Clearly a large scale human intervention makes this scheme unfit for a fully automated real-time system but it can be of interest for some very small level implementations. There is another technique based on cellular infrastructure. Network Overlay Systems use cell phone infrastructure for locating vehicles (Kane, Vermaa & Jaina, 2008). The cell centers with additional hardware and software assess the time of arrival (TOA) and angle of arrival (AOA) of radio signals from vehicles to compute the position of the vehicles. This information is sent to the tracking center through the cell link or a conventional link. Another technique used for locating vehicles computes the time difference for signals from two cell centers to reach the vehicle. This computation is made in a public platform and the position information is sent to the tracking center through the cell phone link. Unfortunately this approach cannot get the vehicle locations fairly accurately. When the Navigation Satellite Timing and Ranging Global Position System (GPS) technique emerged, tracking of vehicles and containers became easier. GPS provides specially coded satellite signals that can be processed in a GPS receiver, enabling the receiver to compute position, velocity and time. Four GPS satellite signals are used to compute positions in three dimensions and the time offset in the receiver clock. The Space Segment of the system consists of the GPS satellites. These space vehicles send radio signals from space. The Control Segment consists of a system of tracking stations located around the world. These monitoring stations measure signals from the space vehicles that are incorporated into orbital models for each satellite. The models compute precise orbital data (ephemeris) and the space vehicle clock corrections for each satellite. The Master Control station uploads ephemeris and clock data to the space vehicles. The space vehicles then send subsets of the orbital ephemeris data to GPS receivers over radio signals. The GPS User Segment consists of the GPS receivers and the user community. GPS receivers convert space vehicle signals into position, velocity, and time estimates. Four satellites are required to compute the four dimensions of X, Y, Z (position) and Time. GPS receivers are used for navigation, positioning, time dissemination, and other research (Lee, Oh & Ryu, 2003). Haugen, Ayers, Anderson and Nissen (2002) used GPS to evaluate vehicle movement patterns and impacts during training maneuvers. Ayers, Wu, and Anderson (2004) evaluated the use of the GPS35-HVS GPS for vehicle tracking and found that GPS was able to monitor a vehicle position and dynamic properties. However there are still some limitations with GPS. On average, a satellite navigation receiver is accurate to within 15 m. A number of positioning errors can occur, limiting accuracy to within 15–25 m. The positioning errors are supposed to intensify when a fast moving vehicle is to be tracked and immediate longitude and latitude calculations are to be carried out (Kane et al., 2008). Additionally, GPS focuses on location tracking not objective tracking. The use barcodes is also a common technology for vehicle tracking. For easy identifying and tracing of products and containers, barcode technology had been used in products and containers management for several years. Nowadays, RFID is beginning to replace barcode techniques because of the limitations of the old technology, especially in logistics. Compared with barcodes, RFID enables the capturing of real-time information in fast moving and bulky product flows with the aim of achieving a high degree of efficiency and assuring high quality. However, the barcode technique cannot benefit from ePedigree, which is an integral and sole data source containing a series of recorded digital product authentications proposed by EPCglobal (Kwok, Ting, Tsang, Lee & Cheung, 2010), as well since containers cannot be opened to scan barcodes to check the products during transportation. RFID can however benefit from it, as it permits the collection of information and influences quality in real-time. Because of ePedigree, RFID technology also allows the tracking of items in real-time across the supply chain. When a product is transported for sale from a manufacturer to a wholesaler, the manufacturer initiates the pedigree. Another transaction takes place when the product passes from one wholesaler to another. This is recorded on receipt of the pedigree without any need for signing the pedigree. The pedigree is subsequently signed on the next outbound transaction to the retailer. Users can know which venues the products have passed through by reading the ePedigree. With the widespread use of RFID tags, many researchers have applied this new technique to the monitoring of the container transportation. Park, Oh, Cheong and Lee (2006) proposed a Container Yard Management System (CYMS). The main purpose of their system is to ensure the security of containers, to prevent the loss of goods in containers and to track and trace containers. The structure of this system is shown below in Figure 2. At the gate, the passive reader and the excitor are installed to read the tags on trucks and containers. In the yard, electronic seal tags are used to check the container security. One reader is an active and electronic seal reader and the other reader is an excitor, which transmits a signal as to the status of the tags. The excitor can make tags fall asleep or wake them up. Active tags and electronic sealed tags use a battery in operation. When a tag is used for a prolonged period in the field, the battery tag is set to sleep status as the tags do not need to communicate with the reader (Finkenzeller, 2003). The reader begins to communicate with the tags when the excitor changes the tag's status from sleep to wake-up by sending a “ModeChange” message to the backend system. Furthermore, Jedermann, Behrens, Westphal and Lang (2006) developed a real-time autonomous sensor system to monitor products when they are transported. The backend system can access the on-the-road sensors of this system. The system also separates the sensors and the RFID tags, so the system can be easily expanded to handle special sensor requirements. The use of RFID also can realize task achievement data and information about the products automatically when the products are loaded or unloaded. In all the technologies stated above, it is found RFID has a good performance in vehicle tracking especially for the management of containers. However, the environment of container terminal is very different from a normal environment. Though there are lots of studies on vehicle tracking and container management, research on the feasibility of RFID technology applied in the terminal environmental is lacking. Consequently, in this study, several experiments are designed to test the performance of RFID in the terminal for container management and tracking. A case study is also conducted to show and to discuss the experimental results. The details are introduced in the following sections. In setting up an RFID-enabled vehicle tracking system in the terminal, there are a numbers of factors affecting the radio wave communication that needed to be considered beforehand. On the basis of these factors, experiments can be devised and tested on these parameters. - Distance. Roads in the terminals are different; and different kinds of RF reader have different readable ranges. Although the range of reader will normally be stated, however, the condition in the terminal is quite different from any other situation. So, distance is one of the parameters that need to be considered. - Penetration. In the terminal, there are many containers which are actually barriers to the RF communication. Since penetration and read range trades off each other, using a long range RF reader such as microwave or UHF will have less penetration ability. This is because the higher the frequency, the easier RFID is affected by the environment. For the application of using RFID to track a loader, penetration is a very important parameter because the radio wave may need to pass through a lot of containers after reaching the tag, or the lack of penetration will need more tracking points. - Speed. Another variable is the speed. If one part of the system, i.e., tag or reader is running at a high speed, there is a chance that no communication will occur. So, it is important to test if the communication is successful when the equipment is running at the highest speed. - Distance between two tags. Each reader has its own read range. For the application of tracking a vehicle, one tag is representing one area, and the read range of the reader should not cover more than 1 tag which may lead to confusion. So, the separation of 2 tags has to be considered carefully. This variable can also be determined by the distance of the communications. Based on the above operational features and the parameters identified to determine success in RFID communication, distance, penetration, speed, experiments are designed to test the equipment capabilities in meeting project requirements. A case study has been conducted in collaboration with YANICT (Anonymous name), a leading world port investor, developer and operator in the Pearl Delta Region in China, to carry out a feasibility study of using RFID in a container terminal. The company is responsible for operating and managing various phases in a port. It has one of the biggest container terminals in China with 208 hectares and 9 berths. Because of the keen competition, the terminal plans to use RFID to facilitate its operation and compete with other ports in the South China Coastal area. Table 1 summarizes the overall port the study area. In the existing Operational Management System (OMS) of YANICT, only the location of Rubber-Tyre Gantry Cranes (RTGC) and the Front/Top Loader is recorded, there is no function for tracking the internal vehicles including internal tractors and patrol cars. However, the operators need to know the location of internal vehicles including patrol cars. The tracking system cannot act as the same way after the Front Loaders or Top Loaders. When the Front Loaders or Top Loaders go to a specific location to do their work, the loader driver would input the location to the system for confirmation. However, since internal tractors and patrol cars go around the yard, the yard is so large that the tower cannot track the location continuously in the way the Front Loader is used. Secondly, the traffic situation in the yard is not visible to the operators. It is very important for the operators to know the traffic conditions in the yard. However, the area monitored by one patrol car (Area Supervisor) is so large that it is not possible to figure out all sorts of traffic problems in that area. If one of the roads in an area has heavy traffic, the patrol car can only notice it if it passes that road or somebody informs the tower. Although the Tower cannot solve the problem by using OMS, they could contact the Area Supervisor to go to the congested area and guide the driver in the area. However, it takes time to do so. On the other hand, the tracking of the traffic situation is even more important with the opening of Phase3B of the container terminal. This is because it will be more difficult to manage the traffic in such a large area. The suggested system is then necessary to show the traffic condition, in addition to the tracking system. Thirdly, the jobs cannot be assigned to the patrol car efficiently. As stated above, the Area Supervisor acts only when he sees an incident happens or is notified. When some incident happens and the Tower is notified by the system or other persons, the Tower needs to find the nearest patrol car to direct to the incident area. So, in addition to tracking the vehicle, the system also needs to have the function of finding the nearest patrol car in order to act as fast as possible. In the current status, the tracking of loaders in YANICT is updated manually. In the existing OMS, there is a function that tracks on the location of the Front Loader and Top Loader. However, the method of locating the Loader is that every time a driver goes to a specific place to work, he/she will update the location to the system manually. It increases the work load of the driver. Furthermore, the tracking of the loader is not a continuous process. The OMS shows the location of the Loader graphically. However, the existing system cannot track the location continuously. When the tower has to assign jobs to the Loader, they will release instruction according to the location of the loader. It leads to confusion in assigning jobs to the right Loader. Limited permission is granted for vehicles to enter the terminal. Every vehicle which needs to enter the terminal has a pass to access to the terminal. The pass has to be checked by a security guard before entering the terminal. By using an RFID tag as a pass, the access of a vehicle can be automated. There are 4 set of RFID readers and tags considered in the experiment. Only one set of equipment will be used in the experiment since the aim of the experiment is to know whether RFID technology is usable in the container terminal. So, it is necessary to find a balance between cost and read range. The specifications of different equipment are listed in the Table 2. It is aimed to find out, when the velocity increases, if the RF communication will be successful. In the container terminal, there are a lot of operations and many machines and vehicles are running. RF waves may be easily blocked by these machines and vehicles and so there may be a failure of communication. This test is aimed at finding out if the RF communication can have penetration behind vehicles and containers. Figure 5 shows the design of the penetration test. Step 4. Increase the number of containers, and repeat steps 1-3. In the second stage, there is a trial run, which is, placing tags in different locations to simulate the real operation. The area selected for a trial run is about one-seventh of the total area of the terminal. In this simulation, the test is carried out in a small area; also, it is not be the same as the real operation. That is, the tag and vehicle will only be tracked in the “large road”. Figure 6 shows the location of tags within the test area. As the purpose of this stage of the experiment is to simulate the real operation, a retrieving software is used to track the data from the database. By using the Retrieving Demo program, a user can input the ID of the vehicle that he/she wants to query, then, the software will direct the user to the related database to get the latest record of the location of the vehicle. Afterwards, the software shows the latest information to the client interface. The web page refreshes itself every 5s so the information would be the most updated one. An example of the tracking process is shown in Figure 8. A user inputs the vehicle number to be tracked, and after a query to the database, the screen shows the location of the particular vehicle. The results obtained in the distance tests are shown in Table 3, while the averages of the trial run result for different areas are shown in Figure 9. Furthermore, the results also graphically show the average performance of the RFID communication in different area as a comparison. Figure 10 shows the readability of each trial. The 100% readability only occurs at the 5 m distance and the readability drop significantly after 10 m. This test reflects the “true” ability of the reader as there is no disturbance near the test area. At distances of 35 m and 40 m, few communications occurred; one of the possible reasons of this is the small size of data. As the readability of the RFID communication drops significantly between 5 m to 15 m, an additional test was carried out in order to know how the readability changes between the ranges. It is important to find out this data because this range is critical as most of the road widths are similar to twice this range. The results of the additional test are shown in Figure 11. As from the additional data, it is found that the readability is still in 100% at 8 m while it starts to drop at 9 m and thereafter drops continuously. Figure 12 shows the readability of each of the trials. It is surprisingly to see that the readability is 100% until 30 m when the test is carried out in this area. This result is very encouraging as it shows that the use of RFID in a normal container environment is possible. Despite the encouraging result, the readability drops significantly at 45 m. One of the possible reasons for the encouraging result is the reflection of radio waves from the container. The reflection of radio waves from the container makes the signal more concentrated in the area. As the range of 40 m and 45 m is not critical as it exceed the longest width of a road, additional tests are not needed. Figure 13 shows the readability of each trial. The result of this test is similar to the free area test. The readability drops steadily after 10 m. However, some the trial readability readings increase at a distance of 25 m. One of the reasons is that the communication in this environment only drops gradually, so the result of data may be similar within close distances. Another reason is that the quay crane at the pier side affects the test result. As there is a drop between the range of 10 m-20 m, an additional test was carried out and the results are shown in Figure 14. The readability in this range drops gradually, starting from 12 m and meets the 50% readability at 20 m.
From the above results, it is found that RFID communication is good in the container areas which occupy almost of the area in the container terminal. However, in other areas, such as the sea side and the free area, the performance is not so good and 100% readability is only achieved at 5m and 10m in the free area and the sea side respectively. So, a special arrangement for tagging is necessary in these areas, more tags are necessary to put on such area. The result of the speed test is encouraging. The RF reader can have 100% readability within the speed limit (40 km/h) in the terminals, as shown in Figure 15. As the test is carried out both in the nearest lane and the farthest lane of a road, the RFID communication can operate well in regard to speed. Figure 16 illustrates the result of the penetration test. It is found that the reader cannot read a tag behind the container. It means that the communication cannot pass through containers or internal tractors. If a tractor stays between the tags and the reader in the vehicle, the communication is blocked by the tractor. Because of this, special arrangements are necessary to solve the problem. One of the suggestions is to put an extra tag at the center of the road. Despite the fact that the RFID communication of the selected reader did not work well in the free area and near the sea side in the distance test, the overall result of the first stage experiments shows that it is possible to use RFID to track vehicle in the terminal. As most of the environment in the terminals like the one in the “Near Container test”, RFID communication can be carried out in most of the areas in the container terminal. It is suggested that extra tests should carried out in order to compare the “real operation” of different readers. Based on the above results, a second stage experiment is carried out. Table 4 illustrates the result of the second stage test. The tags which represent the same area are marked with the same color (except the white color). As the vehicle is said to be entering an area if one of the tag is detected, only detecting one of the tag is deemed to be a successful record, as another tag may be blocked by another vehicle or machine. By combining the results, it is found that only one of the tags had 60% readability. This is due to the communication being blocked by another machine in the period from 6-10 am. Another problem is that there is wrong communication in the cross road area. Some of the detection is incorrect, that is, not detecting the correct tags. Figure 17 shows the tags that are detected wrongly, and are marked in red. It is noted that the system will only accept 100% correct communication and there is no allowance for unsuccessful communication. So, a suggested system is necessary to follow the setup method of the tag “9, 7, 8, 11, 12, 1, 3”. These sets of tags are placed at the stand beside the corner of the road or the stand between containers. However, as the tag number “15” is blocked by a machine for a long period of time and no communication occurred, some suggestions are made in response to this problem. In order to check whether the suggestions stated above are correct, some extra experiments are carried out. However, there are no extra experiments for point 3 and 4 as they are related to the specification of the reader. The validation experiments are on points 1 and 2 only. In this experiment, the procedure is the same with the second stage with the difference in the placing of the tags. Additional tags are placed in the location where that readability is low. On the other hand, the tags are all placed in the same way with the tags which get 100% readability in the “FIELD OF SERVICE TEST”. That is, placing these tags on the stand away from corners at least 30m. Figure 18 shows the location of the extra tags which are marked in red. Table 5 lists the results of the validation test. Additional tags are added (tag numbers 17, 18, 19) in the center of some of the roads. In addition, tags are placed on stands and avoid disturbances such as large machine. The tags are also placed away from the corners of the road to prevent incorrect communication. Despite one of the tags only having 60% readability, all the areas have 100% readability when a vehicle enters an area. That is, the vehicle is wholly tracked in the test period. As a conclusion for this chapter, it is found that the FRID system is possible to be implemented in a container terminal with specific settings, such as placing more tags to track some locations and not putting them corners. From the above analysis, it is found that the vehicle tracking system not only facilitates the operation of the terminal, but statistics from the system helps in other areas. So, the system is worth to implement in the container terminal. However, before deciding whether to implement a tracking system in the terminal, more experiments on different RFID equipment is necessary in order to sort out the best. The authors gratefully thank the Department of Industrial and Systems Engineering, The Hong Kong Polytechnic University for its support of this research work (project code: GYJ12). Ayers, P.D., Wu, C., & Anderson, A.B. (2004). Evaluation of autonomous and differential GPS for multi-pass vehicle tracking identification. ASAE paper no. 041061. St. Joseph, MI: ASAE. Finkenzeller, K. (2003). RFID Handbook - Fundamentals and Applications in Contactless Smart Cards and Identification. Wiley. Haugen, L., Ayers, P., Anderson, A.B. & Nissen, P. (2002). Using GPS to evaluate vehicle movement patterns and impacts during training maneuvers. Proceedings of the Vehicle and terrain mechanics in the 21st century virtual world, 14th International ISTVS Conference. Kwok, S.K., Tsang, H.C., & Cheung, B.C.F. (2008). Realizing the potential of RFID in counterfeit prevention, physical asset management, and business applications: case studies of early adopters. Department of Industrial and Systems Engineering, The Hong Kong Polytechnic University. Lee, K., Oh, S.K. & Ryu, H.Y. (2003). Application of high resolution satellite imagery to transportation: Accessibility index extraction approach. Proceedings of IEEE International Geosciences and Remote Sensing Symposium, 4, 2942–2944. Park, N.K., Dragovic, B. & Kim, J.Y. (2009). Dynamic equipment deployment at a container terminal: Transfer system based on real-time positioning. Strojniski Vestnik-Journal of Mechanical Engineering, 55(2), 83-94. Rus, C., Bilcu, R.C., Egiazarian, K., & Rusu, C. (2004). Scanned maps processing using wavelet domain hidden Markov models. Proceedings of First International Symposium on Control, Communications and Signal Processing, IEEE, 451–454. Wang, L.X., Kwok, S.K., Ip, W.H. & Ng, P.H. (2009). Transportation visualization of perishable products with a RFID and Sensor network. 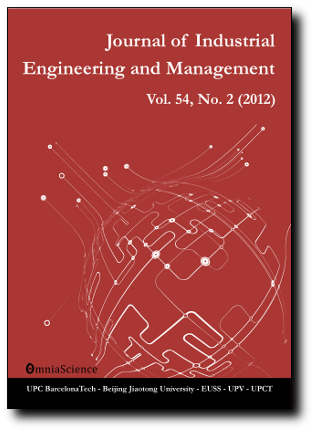 IJIAP International Journal of Information Analysis and Processing, 2(2), 35-42.